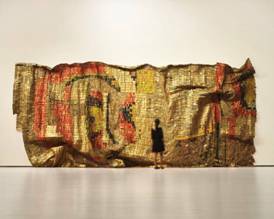 Since the Akron Art Museum’s expansion and reopening in 2007, Dzesi II, the dazzling large-scale metallic tapestry made by El Anatsui from aluminum liquor bottle caps and copper wire, has become one of the most iconic works in the museum’s collection. Befitting the museum’s yearlong 90th anniversary celebration, it is organizing the exhibition and national tour of Gravity and Grace: Monumental Works by El Anatsui, which will premiere in Akron June 17 – October 7, 2012. The exhibition features an acclaimed body of artwork by an international artist at the height of his career, most of which has never before been seen in North America. Organized by Interim Chief Curator Ellen Rudolph, in collaboration with the artist and Jack Shainman Gallery in New York, and funded by the John S. and James L. Knight Foundation, Gravity and Grace highlights Anatsui’s most recent work and features twelve monumental metal wall and floor sculptures. In addition, a series of drawings illuminates the artist’s process, while wooden wall reliefs reference his extensive work in wood and display fascinating compositional relationships to the large metal pieces. El Anatsui’s art has won worldwide acclaim for its power and splendor. He is celebrated for transforming discarded objects into shimmering, pliable artworks of monumental beauty. Drawing on artistic and aesthetic traditions from his birth country of Ghana, his home in Nigeria and various Western art forms including modernist and post-modern modes of expression, Anatsui culls from his environment, both natural and manmade, as a source of material and inspiration. “Akron visitors will be awed,” said Rudolph, “by an exhibition so large in scale that it overflows beyond the 7,000 square feet of the special exhibition galleries into the collection galleries as well as the lobby.” Key Anatsui works will be installed in the Beatrice Knapp McDowell Grand Lobby and the Sandra L. and Dennis B. Haslinger Family Foundation Galleries, providing visitors the opportunity to explore the artist’s relationship to his contemporaries. Installing Anatsui’s work with Sol LeWitt, Morris Louis and Frank Stella will allow visitors to discover different approaches to abstraction. Gravity and Grace: Monumental Works by El Anatsui invites visitors to question where art comes from as well as explore this internationally celebrated artist’s development. In his work, Anatsui strikes a rare combination of stunning beauty, fascinating communal process and deep metaphorical and poetic meaning. Corresponding with the Akron Art Museum’s premiere, Western Reserve PBS (WNEO 45.1/WEAO 49.1) will air the documentary Fold Crumple Crush: The Art of El Anatsui on Friday, June 15, at 9 p.m. In addition to the June 15 broadcast, Fold Crumple Crush will air on Western Reserve PBS on Saturday, June 16 at 11 pm; Monday, June 18 at 9 pm; Monday, June 25 at 1 am; Sunday, July 1 at 7 pm; Sunday, July 8 at 11 pm; Saturday, July 14 at 5 am and Saturday July 28 at 5 pm. Airdates on Fusion (WNEO 45.2/WEAO 49.2) can be found at WesternReservePBS.org/schedule.htm. Community Art Project inspired by Gravity & Grace: Monumental Works by El Anatsui. Did you know that people around the world use over 500 billion plastic bags a year? Once those bags leave the grocery store they may end up littered in the streets before they hit a recycle bin. Just as artist El Anatsui draws from the discarded materials found in abundance in his community, Akron Art Museum friends and visitors are invited to breathe new life into cast-off plastic bags. This summer at branches of the Akron/Summit County Public Library and community art festivals, participate in an art making activity that will become part of a large community artwork to be installed at the museum. After the artist dialogue, be the first to see this exhibition featuring the awe-inspiring work by one of the art world’s celebrated international artists. Visitors are invited to the museum to view these monumental works before the exhibition opens to the public. Refreshments and musical entertainment will be provided. Admission to just the opening party is free for members and $10 for nonmembers and may be purchased that evening at the museum’s Visitor Services desk. This entry was posted in akron, Art News, arts, exhibits, galleries, museums, ohio, shows and tagged akron, akron art museum, art, art news, arts, entertainment, exhibit, exhibition, gallery, museum, ohio. Bookmark the permalink.